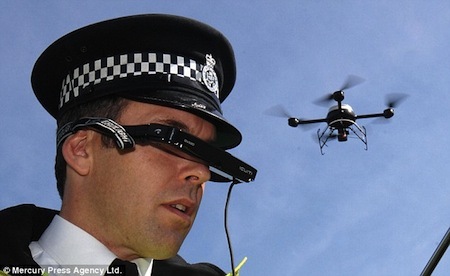 A quadrotor UAV nicknamed "the flying saucepan" made its first arrest in Merseyside in the UK. The drone was deployed by police to try to find an alleged offender who escaped in thick fog. It led officers to a 16-year-old youth, who was hiding in bushes alongside the Leeds-Liverpool canal, in Litherland, Merseyside. The drone, which measures 3ft between the tips of its four carbon fibre rotor blades, uses unmanned aerial vehicle (UAV) technology originally designed for military reconnaissance. The battery-powered device can have a range of cameras attached to its main body, including CCTV surveillance or thermal imaging cameras. It is designed to hover almost silently above crime scenes and send live footage to officers on the ground, but the unit can also 'perch and stare' from a solid platform, allowing the operator to capture hours of footage from a hidden vantage point. I saw pretty much the same thing in Michael Crichton's 1985 film Runaway, which shows how a floater camera can be used to help fight crime. 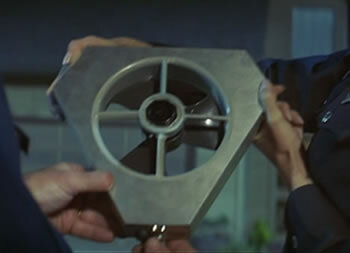 In the movie, the device can fly both outside and indoors; in the film, it is used in a hostage situation. Read more about the floater camera; check out the in-dash video screen and controller for the device.